Volpaia, Tuscany, Italy 2018 - a Chianti wine "castello"
Volpaia is a small fortified village in Tuscany, Italy, referred to as a "castello" in Italian - Castello di Volpaia. Its main claim to historical fame is as the home town of the della Volpaia family of clock and instrument makers. Volpaia retains a great deal of its original architecture and has been attractively restored. It is well worth a visit for those interested in the vernacular architecture of early Tuscany and today offers three restaurants and a number of vacation rental apartments. There is very little traffic within the village of Volpaia and with panoramic views over the surrounding vineyards and forests, together with its location in central Chianti, it makes an ideal base for a peaceful and relaxing Tuscany vacation. Click here for vacation accommodation in Volpaia. 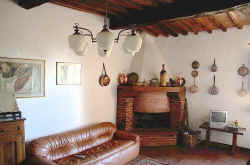 Apartment "Il Cassero" is a newly-restored vacation apartment for up to 5 persons located in an old tower keep in Volpaia in Tuscany. The accommodation consists of a kitchen, large living and dining room, plus two double bedrooms rooms and a single bedroom. Extremely peaceful and within a couple of minutes walk of three restaurants. More about Vacation apartment "Il Cassero". Volpaia was recorded for the first time in 1172 in a document from the Abbey of San Lorenzo a Coltibuono as the "Curte et Castello di Vulpaia". The original defense walls, laid with great precision using local pietra serena (a greenish-grey sandstone), date back to the end of the 12 C and beginning of the 13 C. It was not until the first half of the 14 C, however, when the castle became one of the main centres of the Lega del Chianti, the Chianti League, in the Radda in Chianti area, that it assumed a role of any real importance. Because of its favourable and dominating position, it was soon equipped with a true surrounding wall in the form of a rough ellipse, with the defense towers rising up in a quadrangular arrangement. Today, only a part of this wall and a small, later tower to the north are still visible. There is no trace of the gate which probably corresponded in the defense wall with the street dividing the village into two parts. Only gradually - especially around 1500 to 1600 - did the castle lose its purely defensive function, new gates then being constructed. The parish church, dedicated to San Lorenzo since the 14 C, has a hexangular arch. Upon orders of the Lord of the castle, the Commenda di San Eufrosino was established in 1443 outside the gate of the ancient castle, in order to shelter and provide care for pilgrims and wayfarers. The site of the hospice is indicated by a Maltese cross carved under an architrave. The building shows characteristics of the early Florentine Renaissance such as the simple rectangular structure and the contrast between the gray of the pietra serena used for the ornamental elements and the white of the walls. There were very few buildings outside the surrounding wall and those few were all mentioned for the first time only at the end of the 16 C.
The Florentine family of the same name were originally from Volpaia and in the 15 C and 16 C represented erudite artists and builders of armillary spheres, clocks, compasses and notturlabi (hand-held astronomical instruments that give the time during the night based on the position of celestial bodies): the most famous were Benvenuto and Lorenzo, the latter being a friend of Leonardo da Vinci and famous for having built to a commission from the Medici, the planetary clock of Palazzo Vecchio in Florence, a copy of which can be seen at the Museum of the History of Science in Florence. A part of Volpaia is now incorporated into the Castello di Volpaia winery belonging to the Stianti family. The winery includes a restaurant and a wine shop, and tours of some of the cellars are possible. 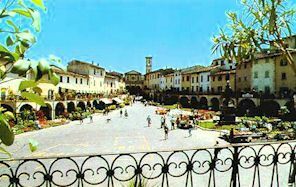 For your holiday rental in Chianti - stay in the cool Chianti hills - villas, B&B farm house and village rooms, apartments with pool. 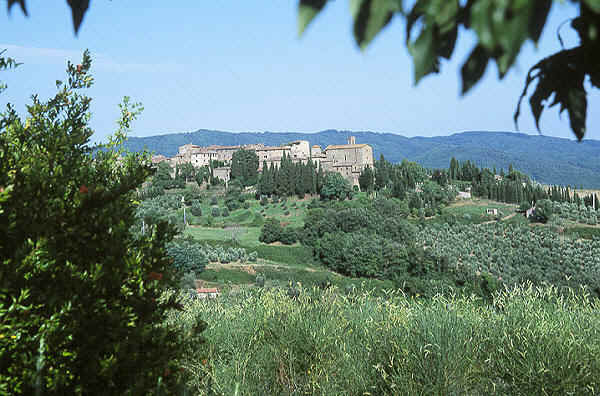 Chianti Tuscany vacation rentals and holiday homes. Vorresti pubblicizzare la tua attività su questo sito web per Volpaia e ricevere traffico in entrata dalla nostra rete di più di 50 portali relativi? Clicca qui per ulteriori dettagli in merito alla nostra soluzione integrata per una presenza su internet piena di successi.